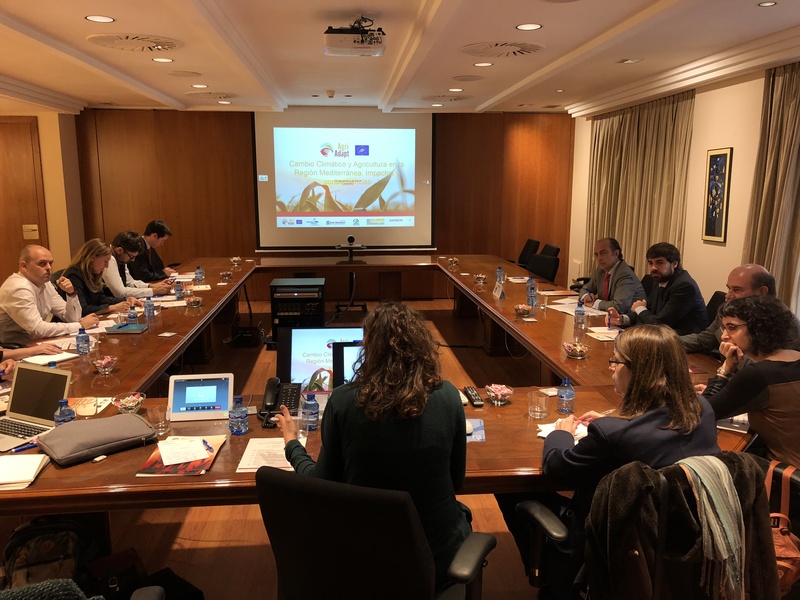 On the 22nd of October 2018, an informative session with agrarian insurance companies regarding sustainable adaptation measures to climate change took place in Madrid. In this session, information about policies, measures and resources of Spanish agriculture and agrarian insurances were provided. Impacts and consequences of climate change upon Mediterranean agriculture were also tackled, the LIFE AgriAdapt project was presented and its methodology and vulnerability assessment tools at crop and farm level shown. Once the general vision of the project was tackled, several examples of case studies on pilot farms were shared. In this case studies, a vulnerability assessment at farm level is performed and specific adaptation measures proposed. The case studies included cereal crops, oilseeds, fodder crops and legumes. Moreover, the strengths, weaknesses, opportunities and threats of the agrarian sector in the Mediterranean region were shared. Last but not least, there was also time for questions and discussions about the vulnerability assessments and adaptation measures proposed within the frame of the LIFE AgriAdapt project. The following agrarian insurence companies attended the session: Unespa, Caja De Seguros Reunidos – compañía De Seguros y Reaseguros S.A., Mapfre España – Compañía de Seguros y Reaseguros S.A., Grupo Allianz, RGA Seguros Generales Rural S.A. De Seguros y Reaseguros S.A., Agroseguros, Grupo Generali, Pelayo – Mutua de Seguros y Reaseguros APF, Metlife Europe Insurance D.A.C. Sucursal en España, Plus Ultra – Consorcio de Compensación de Seguros OECC, and Consorcio de Compensación de Seguros.